This Titan had a Leyland Metal frame Highbridge body which I think was the ultimate in half cab double deckers especially on a PD 2/12. The first shot shows the vehicle when I had repainted it back to its original Rawtenstall Corporation livery whilst the second shows the bus ready to attend the 1976 Trans Pennine Rally in Rossendale livery basically the result of a good wash and polish a few months after I acquired it. Here is a brief history of Rawtenstall No 18. First registered new to Rawtenstall Corporation on 23rd October 1953 and transferred to the Rossendale undertaking in 1974 on government reorganisation when Rawtenstall merged with Haslingden Corporation. 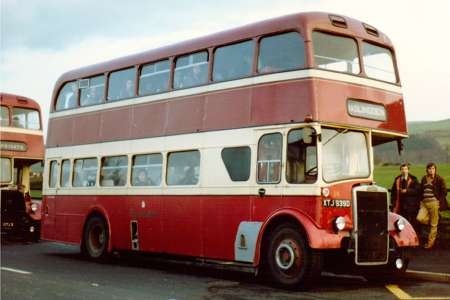 Withdrawn in October 1974 after covering 585,860 miles in service and sold to Bingorama of Bellshill, Lanarkshire in 1974 and run on services around Motherwell and Hamilton etc taking people to a bingo hall in Bellshill. Purchased by Gerald Walker, Wigton, Cumbria in April 1976 and restored to former Rawtenstall livery. The bus was sold back to Rossendale Borough on the last day of Half Cab operation in November 1982. After a few years it was sold to Brian Crowther of Black Prince, Morley, Leeds. No restoration was carried out and consequently the bus was sold to Carl Ireland, Hull who sold the bus on to a preservationist in Norfolk. Here again the bus did not have any work carried out on it in the six or so years it was at this location. In October 2009 Steve Morris the well known preservationist accompanied by a coach operator friend went to collect the bus with a recovery vehicle with the intention of towing it back to Taunton having recently purchased the bus. However when they got to Norfolk the bus had been started and was running, after checking all systems over apart from a minor easily rectified electrical fault it was decided to drive back. After an hour at the wheel Steve changed over to my AEC fanatic friend and once he got hold of this superb Leyland was reluctant to changeover later on driving almost all the way back. (He has now changed his opinions of Leylands a fact I have been trying to persuade him for some years). This journey is no mean feat for an elderly bus fully restored but No 18 had not turned a wheel for about 6 years and was 57 years old. Work is now progressing on a full restoration and I understand from Steve that a considerable amount of welding work has to be carried out on the rear chassis frame. but generally the body is in fairly good condition. I am looking forward to the day when the bus takes to the road again which will not be too far into the future I hope. There are more shots of No 18, interior and exterior to be seen here. What a brilliant set of pictures of such a classic vehicle. Some of today’s body builders could learn a few lessons on how to style a bus and build it in such a way that body panels stay on the bus without pop rivets every other week. Indeed Terry, and it is exactly the same inside and out as Samuel Ledgard’s 1952 trio – PNW 91/2/3, the last vehicles the grand old man bought before his death in April of that year. Rode on this back in its Rawtenstall days and hope to see it somewhere in the north-west soon alongside the two superb Rawtenstall single-deckers which are already doing the rally circuit. Where would we be without hard-working preservationists? Nice one Gerald! 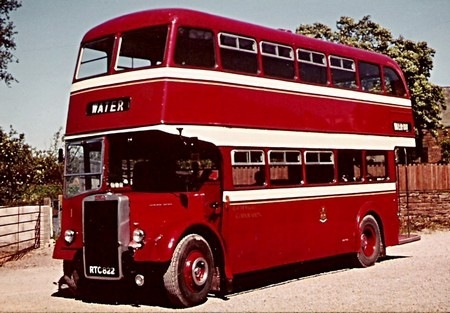 Thanks for the compliment Neville, No 18 was a lovely bus both to drive, ride on and as Terry says above todays designers could learn a lot from this lovely workmanlike but pleasing to the eye double decker. Chris seem to recall that Sammy refused to pay Leyland the price requested to paint these buses (PNW 91/92/93) and had them delivered unpainted so he could save a few quid and paint them at Armley. That’s quite right Terry and I really can’t understand why he did that – excellent though his own craftsmen were at repaints I have to say that they didn’t do justice to these three fine brand new vehicles. Sadly they also had pretty unsatisfactory "home made" destination blinds at first. As an AEC man I have always also been a big Leyland fan. 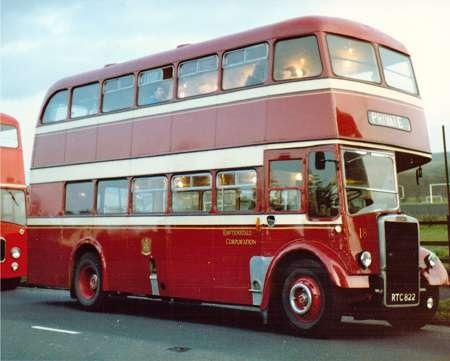 Among my all time favourites were Sheffield Transport’s 656 – 667, 1952 equivalents to this superb example. I fully concur with the opinion that Leyland made one of the best and, simply, stylish bodies on the market and that this, final, version was the finest. Early metal framed Leylands were a structural disaster. Leyland then enticed Colin Bailey away from MCCW – who arguably had the best metal frame designs. Leyland never had problems from that time onwards. Quite moved to see the Titan destination to the village of my birth ‘Water‘- and more so because I began my apprenticeship at Rawtenstall Corp Motors in 1955. I was in the paint shop. I don’t recognise the interior photos, nor remember working on it – so I guess it didn’t come in for a repaint until after I left in 1960. In the 1950’s it was all brush painted, and the foreman got to do all the fancy bits like lining, much else was by transfers such as the coat of arms. I’m totally tickled to come across these pics by accident, and it has made the day for a 71 year old verging on 17. I can imagine the shock and pleasure of seeing a photo of a vehicle with twin connexions with your past, Barrie! As an aside, looking at the supplementary photos reminded me of the square dashboard dials which Leylands of this period possessed. I’d quite forgotten. I was also interested in the heaters the bus had been given, something which should have been de rigour in buses working in the challenging weather up North, but probably wasn’t! I digress here, but my coldest (unheated) journey ever was in the RAF (1958) when, on Winter Mondays, I’d get something like the 5.30am trolleybus from Eastney Depot (Southsea) to Hilsea (N. Portsmouth), change onto a Southdown (PD2?) to Fareham, get onto a Hants & Dorset Bristol left out in the yard all night and with frosted-up windows, then, at Warsash, walk to the pier which jutted out into the River Hamble, then board an RAF air-sea rescue launch, staying on deck, across Southampton Water, to Calshot. At the office, it was stone cold and needed a coke fire laying and set going. We would not be warm until noon! The upper saloon seating capacity is most unusual for this type of body in being for 31 passengers – the norm being 30. Presumably Rawtenstall specified a seat for three on the nearside by the emergency window ?? Great to see this bus I rode on these as a youngster, when I was brought up living at Helmshore, I always remember the Haslingden buses were recognisable by the blue seating which remained after the merger. Proper buses! All the best with your restoration look forward to seeing it again. What a beautifully presented traditional Leyland PD2! Presumably the top picture is the original livery style and the lower one is a later application, I cant decide which I like most, I think I’m tempted towards the latter! Yes Rawtenstall had an extra seat added on the top deck according to the log book also an acquaintance from Rawtenstall remembered the extra seat being added. What a fabulous set of photographs. I have always loved Leyland bodywork particularly the emergency rear exit. Looking forwards to seeing this bus on the rally field. This is one of the most handsome and elegant bodies ever built, the beautiful colour scheme immaculately applied only does it more credit. I was born and lived in Southdown territory and they had 54 of this particular type. The Leyland bodywork was always my favourite, the superb Apple green and cream paintwork looked absolutely gorgeous. In my personal opinion Southdown’s insistence on having half drop windows fitted improved the side view by looking less heavy. 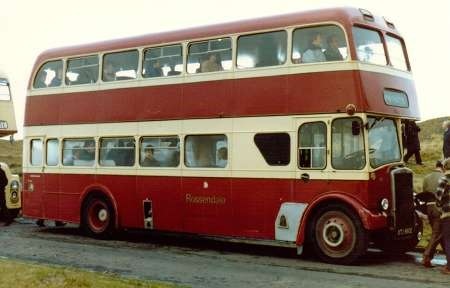 To follow-up on the original post: although the Boroughs of Haslingden and Rawtenstall were amalgamated (together with the Borough of Bacup, Whitworth UDC and part of Ramsbottom UDC) on 1st April 1974 to form the Borough of Rossendale, Haslingden and Rawtenstall had merged their transport undertaking to form Rossendale JTC on 1st April 1968 – they had shared the same GM since the early post-war years (who, at least in latter years, also looked after the Ramsbottom fleet), the Haslingden fleet was small (3 vehicles? ), and Haslingden’s main route (Accrington-Bacup) was joint with Rawtenstall. Just to drift off-thread for a bit: Ramsbottom was involved in the discussions concerning the Rossendale JTC (shared GM, small fleet, and principal routes [both Bury-Rawtenstall] joint with Rawtenstall [and Bury]) but decided to remain independent. Now here’s a question: by this time, 1967/8, I presume planning for the formation of SELNEC PTE would have been well-advanced, and the "original" SELNEC area extended north from Bolton/Bury to include Ramsbottom – so would "the Ministry" have allowed Ramsbottom to throw its lot in with Haslingden and Rawtenstall at that stage? If it had done Ramsbottom would have retained more influence over "its" bus operations – it certainly sought exemption from incorporation into SELNEC, on the grounds that alone amongst the constituents it didn’t penetrate the "central area" – and then in 1974 parts of the SELNEC area to the north of Bolton/Bury were excluded from the GMPTE area. I presume that the second photograph is post-1968/RJTC – as two (I assume Haslingden and Rawtenstall) crests are shown. 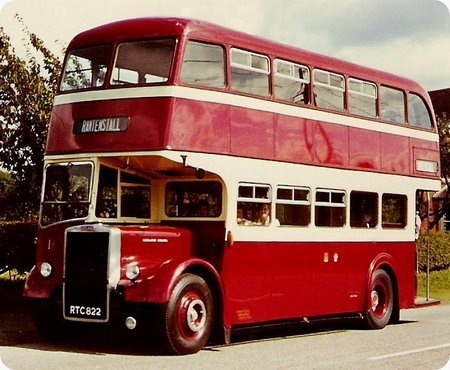 The Rawtenstall maroon seems to have survived on Rossendale’s buses in one form or another until the present day – despite last month’s rebranding as "Rosso". I always thought that the ‘piece de resistance’ of Leyland vehicles of the time were the aluminium rear hubs. Sometimes it’s these ‘petites touches’ which often make the difference. And I confess to never have noticed the two crests on the second photo in the past, despite looking at them several times! Haslingden might not have had the biggest fleet in the world, but it’s size was c.17 vehicles in the early 1960s, down to c.15 at the time of the merger with Rawtenstall. Considering municipal fleets alone, Ramsbottom, Bedwas & Machen, Llandudno, and Colwyn Bay were all smaller – not sure about Lowestoft, I haven’t checked that one out. Also Hartlepool with four vehicles, which were operated on behalf of the Council by BeeLine. The aluminium rear hub covers would be supplied by Leyland in the colour specified by the operator and were introduced circa 1951, possibly in response to AEC’s aluminium hub cap, the Leyland "advantage" being the AEC cover was smaller and the AEC badge, which covered most of the cap, was always in AEC house colours. The inclusion of Ramsbottom in the SELNEC area was always contentious. I moved to Rossendale in 1975 and it has to be said that both Ramsbottom and Rossendale were fast becoming Manchester commuter dormitories at that time and, with the lack of a rail connection and the proximity of Rawtenstall and Ramsbottom to Bury and Bacup and Whitworth to Rochdale, there was an argument for both departments to have been absorbed if not in 1969, then into GMT in 1974 – which makes the 1974 exclusion rather odd. As Mentioned in Gerald Walkers text, these photos were taken on the last day of Half Cab operation in Rossendale, November 1982. No 18 (just re-purchased, that day) accompanied the last two PD3’s 39 & 46 for a tour of the area. Going back to your most recent post, Philip R, Haslingden’s one trunk route was of course the one from Accrington to Bacup, as you had correctly stated earlier, rather than Bury. (Jointly-operated with both Rawtenstall and Accrington – as, indeed, you appeared to imply at one point). The present-day equivalent of the Accrington-Bacup service, operated solely by Rossendale (Rosso? ), runs every 15 minutes for most of the day, although there is a slight enhancement at AM peak M-F. In 1992-4, when I did a small amount of driving on the route myself, it ran every twelve, so going back to the 1960s I would imagine it would have been at least every ten. Haslingden’s share of all-day workings would, I think, have been at least three duties (if its share of the route was a third, that is – which is a big presumption), and peak duplication or enhancement was much more common in those days than it is today. Add to that services to/from the Helmshore area, a service to Stone Fold, maybe other minor services which have since disappeared without trace, likely schools/works services, a spare cover of, I imagine, three/four buses, and you can soon account for a fleet size of fifteen. Still, I hope someone can come up with a 1960s Haslingden timetable – or a Rawtenstall or Accrington one, for that matter. David, oops! yes, of course I meant Bacup. Regarding the Accrington-Bacup service, the running distance is 14.4 miles each way. In 1967 I was working in the area for two days a week and regularly driving along the route. This is from memory but the impression remains that Rawtenstall and Haslingden had equal workings and Accrington was the junior partner with fewer vehicles committed. Frequency was enhanced at rush periods when Accrington and Haslingden provided extra vehicles, including short workings from Accrington to both Rawtenstall and Baxenden – the latter a solely Accrington affair. I can’t confirm the standard frequency but a 10 or 12 minute headway makes sense. Bacup terminus would often see two vehicles together for a few minutes. The date for the withdrawal of half cabs is interesting. It’s hard to believe that nearly 31 years have passed but I wonder if anyone can comment on any use of half cabs on both schools and driver training after that date. A strange feature of the Bacup – Accrington route was that the fares were collected in two sections; it was necessary to rebook at Rawtenstall, even though the bus was working through. I remember one occasion when I travelled from Bacup on an Accrington Guy; on arrival at Rawtenstall we caught up with a Rawtenstall PD2 on the preceding journey on the same service. The conductor couldn’t understand why I chose to stay on the Guy rather than transferring to the other bus to get going sooner! The present day Rossendale service operates through from Accrington to Rochdale, Rossendale Transport having taken over the former Rochdale service 16 (Rochdale – Bacup), later Selnec service 464. The through service still uses the latter number. The Rawtenstall fleet was officially known as "Rawtenstall Corporation Motors" – the use of the word "Motors" in the title of a municipal bus fleet was, I believe, unique. Wallasey were another corporation to use the term ‘Motors’ in their title, quite prominently so on the older vehicles. This bus is now nearly roadworthy and is about to move under its own power from Taunton to Coventry so that interior restoration can be completed over this winter. I used to think the Rawtenstall livery was pretty special. Although as a kid I found the Ramsbottom/Rawtenstall fleets a bit confusing as the livery was similar, it was just the detailing that gave the game away. Only had one ride on a Haslingden bus, and at the time I had no idea such a fleet existed. My reaction when it rocked up at the stop was (roughly) What’s an Ashton bus doing here? Of course, I should have known better even then, especially as the blue was a different shade. Like Brian I too thought I had seen an Ashton bus when passing through Haslingden as a naive 10 year old! As a native of Rochdale I had seen Ashton buses in the town centre but my horizons had still to be broadened to include Haslingden. Brian and David comment on the Ashton blue against Haslingden blue. I’m wandering off topic here, folks, but I hope nobody objects! Clearly, it does depend on the film used, the lighting conditions and the viewer’s eyesight, but I’ve long had the idea that the shade of blue on Birmingham City Transport buses and on Royal Blue coaches was very similar. I know my eyesight isn’t what it should be, but any thoughts, please? The vehicle appeared in it’s new livery at the Taunton Running Day on May 8. I rode on it-remarkably rattle-free and atmospheric. The Haslingden blue was a paler shade than the from 1954 and onwards Ashton blue. Differing film stock does affect colour, as does the age of the original print or slide if not corrected. Having lived in both Ashton and Haslingden I would suggest that the Ashton blue actually got darker over the years or that may have been an optical illusion when the amount of cream under the windows on both decks was reduced. Turning to the subject of this thread, my view on painting preserved vehicles in liveries they never carried in service has been aired here and elsewhere before but it has to be said that the Scout livery looks fantastic. Roger, I was allowed to drive the bus again by Steve while visiting in October 2016 almost 36 years since I last drove it from Cumbria back to Rawtenstall on the last day of half cab operation in the borough.I felt as though I had last driven the bus the previous week every thing was so familiar to hand etc. This was and still is a fantastic bus to drive I am so pleased to see it back on the road again. The interior restoration is remarkable, well done. It will be running at Winchester May 1 and of course Taunton on May 14. Can anybody help me with a gap in my Rawtenstall Corporation archive. I’m trying to find a view of Leyland TD5c No 33 registration number CTJ 165. Its the only one of this batch that I don’t have.